Santa Clara-based Vantage Data Centers reset the shot clock after an ownership group led by Digital Bridge invested $1.2 billion to recapitalize the largest 100 percent wholesale player in Silicon Valley, and now it’s expanding into Northern Virginia, the largest data center market in the US. After an exhaustive two-year process, Vantage closed six months ago on a 42-acre site in Ashburn, near the intersection of Route 28 and Waxpool Road, located within the former AOL campus. One of its neighbors will be Infomart Data Centers’ Ashburn facility. Vantage's new owners are funding its first expansion outside of its West Coast markets in Silicon Valley and Quincy, Washington, Vantage president and CEO, Sureel Choksi, said in an interview with Data Center Knowledge. Vantage has become a preeminent player in the Silicon Valley market with 75MW of existing and planned expansions under development, along with a second campus planned for nearly 70MW of critical power. Ashburn represents the company’s largest expansion to date, with a planned billion-dollar investment to build a new 108MW wholesale data center campus with five buildings that will total over 1 million square feet. The Vantage Ashburn campus investment will likely exceed $1 billion when the site is fully developed. The move is a response to demand from the company’s cloud and enterprise customers, who have expansion plans on the east coast, Choksi said. "There is a very high level of interest, and about a 90 percent cross-over from tenants leasing in Silicon Valley that already have deployments in the Ashburn market," he said. Choksi explained the time was right for a new player with credibility to enter the Northern Virginia market after the recent merger of Digital Realty Trust and DuPont Fabros Technology, the number-one and number-two companies in the region by market share. Silicon Valley is a high-barrier to entry market, where existing industrial and office-flex buildings are being torn down and replaced with multi-story data centers. One of the advantages in Northern Virginia is the availability of greenfield development sites along with a cooperative local government and an electric utility that’s been able to keep pace with staggering growth. 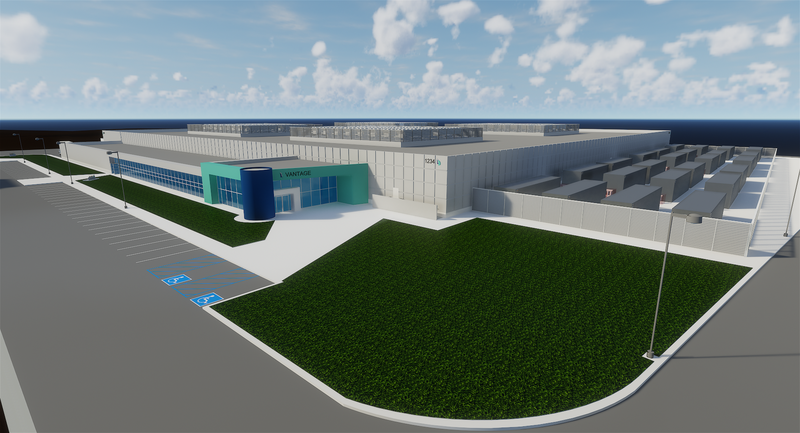 Vantage is planning to build a central utility plant to support the Ashburn campus and a two-story Phase 1 building of 230,000 gross square feet, supporting 24MW of critical IT load. Choksi said the entitlement process was almost completed. The timeline for the project is to have a shovel in the ground by Q1 2018, with anticipated delivery of commissioned data center space in Q1 2019. Available land in Ashburn has recently jumped up in price to $1 million per acre. Some asking prices are now even higher, which makes it essential for new development to be multi-story design. One of the reasons Vantage decided to pay up for this site is the abundance of fiber and low latency to the former MAE-EAST network access point. Notably, there is no single customer driving the expansion, but Choksi feels that the plans for future customer growth in this market "were staggering." The proximity to diverse fiber routes remains crucial for Vantage's hyper-scale customers. Choksi did not reveal any names, but quipped they were "the usual suspects." Choksi plans to follow a similar playbook in Ashburn to the one that has been successfully executed in Santa Clara. Vantage will continue to pursue its business model of focusing on wholesale deployments with flexibility to provide data halls from 500kW up to 6MW. Even though DataBank is also a portfolio company of Digital Bridge, Vantage will be open to leasing space "to all comers" interested in providing retail colocation and managed services at the new Ashburn campus. Choksi pointed out that although Vantage and DataBank share the same chairman, Digital Realty founder and former CEO Michael Foust, the makeup of the boards is not identical. The two companies are run separately, with distinct strategies. DataBank is primarily focused on retail colocation in secondary markets, while Vantage is pursuing a purely wholesale strategy in top US markets. The absence of DuPont Fabros as a standalone competitor may or may not create an opportunity for other wholesale landlords in Ashburn. Digital Realty now has unmatched scale, and its current CEO Bill Stein's team will be working hard on pressing its home court advantage. Vantage chairman Foust also has deep relationships in the industry forged by his long tenure at the helm of Digital. Cloud HQ founder Hossein Fateh, a DuPont Fabros co-founder, has already signed Microsoft to the largest lease -- so far -- in Northern Virginia. Meanwhile, CyrusOne has carved out a niche there and in other markets as a low-cost provider with a speed-to-market edge. Just when you thought the Ashburn market couldn't get any more competitive, another serious player tosses its hat into the ring and kicks thins up a notch. Investors need to pay careful attention to pre-leasing and build-to-suit backlogs announced in third-quarter results by publicly traded data center providers in the coming weeks. The bottom line: Customer relationships are becoming more valuable than ever.